Big Hat Logan is a scholar of the soul arts. He is searching for more wisdom in Lordran. Master Logan was a famous Sorcerer and a royal member of the Vinheim Dragon School before he turned Undead. His nickname stems from the gigantic hat he wore, which completely hid his face. He was hailed as the greatest sorcerer of the Vinheim Dragon School, despite his methods considered to be heretical, as he believed in no gods, no transcendence; only truth. Logan, as everyone who turned Undead, was exiled and he started his search search for the legendary Regal Archives, which houses the knowledge of the Father of Sorceries. Logan is credited with having developed the Soul Spear Sorcery among others, which is referenced repeatedly in the legends and is said to be on-par with Lord Gwyn's lightning. In his attempt to reach Anor Londo, presumably to gain access to The Duke's Archives and thus, its vast store of endless knowledge, he became imprisoned in Sen's Fortress, where he first encounters the Chosen Undead. He says he is going mad from the inactivity, and offers to teach the Chosen Undead spells in exchange for releasing him. 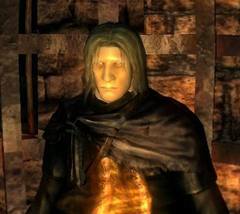 Upon releasing him, Logan returns to Firelink Shrine to take notes, promising to impart his knowledge to the Chosen Undead when they are next at Firelink Shrine. He doesn't stay long though. He ventures forth Sen's Fortress and eventually arrives to the Duke's Archives, only to be captured again. Later, if released, he is found studying Seath's books and seems to be losing his sanity. His final appearance is in the original room where Seath the Scaleless is first encountered. ‍Logan has gone insane and is hostile to the player. Otsuka: Now that we've covered the maps, I'd like to ask about the NPCs. There certainly are a lot of memorable characters in the game. Miyazaki: Thank you very much, we spend a lot of time on them, so I'm happy to hear you say that. Waragai: Personally, I really like Big Hat Logan. Miyazaki: That was one of (Mai) Hatsuyama's designs, wasn't it? Hatsuyama: Yes, it was… but I have to ask, why did you make him naked? Miyazaki: Huh? I made him naked? Waragai: Haha, I'm sure it was your idea, Miyazaki. It's Logan's goal to gain the power of the ancient dragons, so in order to do this, I had an image of him casting off his human clothes. It's similar to using the Dragon Head or Torso Stone, you have to remove your equipment. Of course there are gameplay reasons for this too, but there was also this image of the player leaving something of their humanity behind. Similarly, Logan removing his clothes is his attempt to bring himself closer to Seath in some way. Although I couldn't take his hat off because no one would recognise him, but personally I like to think that unlike the followers of the path of the Dragon, Logan sought to gain the dragons power while retaining his pride as a human. Hatsuyama: I drew a lot of designs for underwear so I'm a little disappointed he didn't emerge wearing one of those instead. Miyazaki: In his underwear… If we had done that I'm not sure it would have been taken in the way I wanted. But I also really like Logan as a character, I spent a good amount of time on the design. He's a wise man or a sage but I really wanted to make him unique so I had quite a few designs made. Once we arrived on the idea of his big hat, the design came together, but that wasn't there from the start and only emerged through continual revisions. Miyazaki: Yes, we went through that process many times. Hatsuyama: I thought he'd turn into a mushroom, but I was told that it wasn't an issue, so I just went ahead and did it. Satake: Turn into a mushroom… I like that. Hatsuyama: Artistically speaking, I made his hat far too big, you can't actually see his face anymore. Miyazaki: I think it turned into a good silhouette in the end, he looks like someone who doesn't like other people… I can empathise with that, haha. When Logan is encountered hostile, he is not hollowed, but was simply driven insane in a more traditional sense. 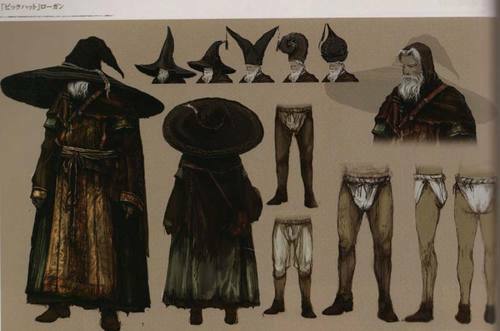 All NPCs appear in their charred, undead forms when they encounter players after hollowing, but Logan just appears disrobed save for his hat. Both Big Hat Logan and Seath turned mad after studying crystal sorceries in the Duke's Archives. This theory is also supposed by the Design Works interview. 2. Logan wanted to be captured by the Serpent Men because he knew they would take him to the Duke's Archives, however, it is may be that the Serpent Men forgot about him. Logan therefore decided that he was tired of waiting, so when the Chosen Undead showed up, he asked them to free him. 1. Logan's original plan of being captured in Sen's Fortress and taken to the Duke's Archives may have succeeded this time, however one point against this is he may not have wished to risk being forgotten again. 2. Logan made it through Sen's Fortress and into the Duke's Archives. He then took on Seath and was defeated, just like the Chosen Undead. Seath and his Serpent Men locked Logan in a cage then (this would explain how Logan knows that Seath is impervious to any damage and also why he is found in Seath's room when he is imitating him). Oh, thank you very much. I'm saved. That makes twice. I must be sure to repay you. I will visit the archives. If I discover any new spells, I shall share them with you. Prepare to be impressed, by the onward march of sorcery! Don't mind me. Go on ahead. I'll head out soon. I wish to lay down my plans before I visit the Archives. Hello there. I was expecting you. This place is truly magnificent, more than expected, even. As promised, I shall share the new sorceries with you. And the secret of Seath's immortality. Ah, the secret of Seath's immortality? If you have fought him, and were imprisoned, you must know that Seath is a true Undead, different from ourselves. His wounds close promptly and no mortal blow affects him, granting true insulation from death. It is an effect of the Primordial Crystal, a sacred treasure pillaged by Seath when he turned upon the ancient dragons. So, only by destroying the Primordial Crystal can you so much as scratch his hide. And it so happens, the primordial Crystal is in the inner garden of these very archives, the Crystal Forest. A great pool of knowledge, the fruits of superior wisdom and an unquenchable desire for truth. Some would say Seath had an unsound fixation …But his work is a beautiful, invaluable resource. All progress demands sacrifice. And I certainly hear no antipathy for that wonderful scaleless beast. Mm…mm… Who are you…? Stay clear…stay clear of my work… Curses upon you! How dare you disturb me! Big Hat Gigantic hat worn by the great sorcerer Logan. It completely hid his face, which led to his nickname "Big Hat." Famously antisocial, Logan used it to block out noise and people's stares so he could focus on his own thoughts, but it does not possess any special magic powers. Sage Robe Robe worn by Big Hat Logan. It is said to have been from his apprentice days at Dragon School, but it is so worn out, no one knows what it originally looked like. Logan, who cared little for his appearance, no doubt ever bothered to change out of it. Logan's Catalyst Catalyst of Big Hat Logan, the great sorcerer and seeker of knowledge. Originally the same catalyst employed by the Vinheim sorcerers, only terribly strengthened over time due to Logan's use. Very powerful when used by one of superior intelligence. Tin Crystallization Catalyst Catalyst imbued in terrifying crystal magic. Used by Logan after his fixation on Seath. Makes all sorceries incredibly powerful, but demands extremely high intelligence from its wielder, and halves sorcery usages. Homing Soulmass Sorcery developed by Big Hat Logan. Life originates in the soul; no wonder the soulmass draws toward it. This sorcery is a window into seeker Logan's methods. Soul Spear Sorcery developed by Big Hat Logan. A symbol of Logan's strength, the soul spear is referenced repeatedly in the legends, and is said to be on par with Lord Gwyn's lightning. White Dragon Breath Sorcery developed by Logan during his infatuation with Seath the Scaleless. Although it no longer causes curses, what madness caused old Big Hat to appropriate this frightful power of the ancient dragons? Cage Key Key to the hanging cage in Sen's Fortress. If a hapless adventurer becomes fatigued during an imprudent attempt to overcome the fortress, the serpent men will not kill him, but lock him up in a lonely cage. Eventually, unless they have forgotten, they drag the victim off to who-knows-where. It's not that I am concerned for Master Logan's welfare. Even in this treacherous land, Logan's skills are unmatched. He is a true hero. Well, it's really my own conceit, now isn't it? Have you spoken to Master Logan? He is an accomplished scholar. The arts of sorcery would never have come this far without his contributions. And he has the nerve to go risking life and limb! What a stubborn old fellow. Have you tried using one of Logan's sorceries yet? As he sees it, there are no gods, no transcendence, only truth, and Logan wishes to elucidate it. It is this heretical methodology that has allowed Logan to advance sorcery to the point that he has. In a word, he is a hero. Despite the awful rumors. Oi, did you see him? Big Hat Logan, the legendary sorcerer, in the flesh! They're making me feel quite inadequate, to be honest!